I've been asked to show some local shops - so here's a personal selection. 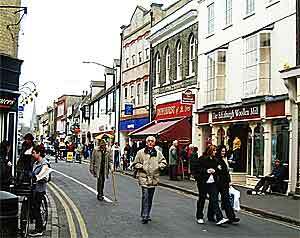 In fact, St Ives is an attractive shopping centre to which many people come from the surrounding villages. There's most of what you'd expect in a small town - including a surprisingly large number of hairdressers (over 16 at the last count) and, in recent times, at least 7 charity shops! Crown Street stretches between Broadway and Market Hill. On the right are the Edinburgh Woollen Mill (happy home of never-ending sales), Dewhursts the butchers (now replaced by the popular Costa Coffee), and Superdrug (there are also centre-of-town pharmacies at Boots and Lloyds). As always in St Ives, look up at the tops of buildings above shop level, and you'll see a fascinating variety of styles! This photo was taken before the 1992 "improvements" that narrowed the street further. The most traditional shop of all was Bryants, (on the left) a department store, founded in Victorian times and run by the same family - but it closed in 2002. The white building in the right background used to be Woolworths. 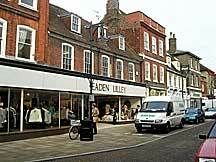 Locals were delighted when Eaden Lilley opened their impressive new department store in Bryants' old premises in time for Christmas 2003. 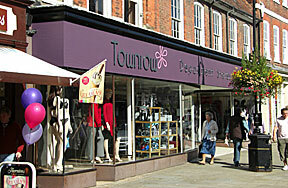 It was taken over by Townrow in 2009. United News in Crown Street used to be not only a newsagent but the post office too. It too is closed now. To the left is the Royal Oak pub that has the date 1502 over the door, but the building is probably 18th century. In 1801, a bullock is said to have escaped from the market nearby, and rampaged through the building and up the stairs, only to crash through a first floor window. 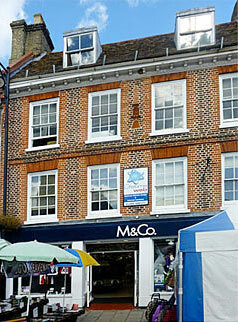 M & Co's clothes shop on Market Hill only dates from 1992, but the building goes back to 1719, when it was built as the Bell public house. The sign of the bell can still be seen midway between the two central windows immediately below the roof. 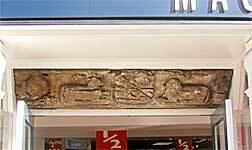 Above the door can be seen this old carved beam (dating from the 16th century) showing the arms of Ramsay Abbey. Waitrose is conveniently situated alongside the main car park. It was built and opened in 1990 to combat the risk of large out-of-town supermarkets taking all the trade from the town centre. However this did not stop the very popular Morrisons opening on the outskirts of the town in 2018. 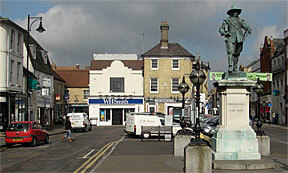 On the left of the picture, is the St Ives Public library (some free internet access provided for library members!). 2008 saw the arrival of W H Smith (with its distinctive blue front) in the old Choices video shop. 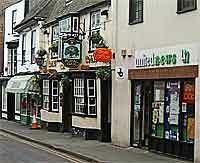 Unfortunately its presence must have contributed to the closure of Walkers Bookshop in Crown Street in 2009. 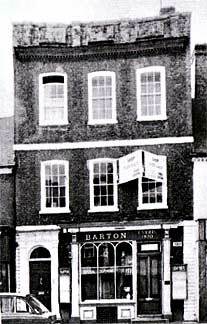 Left: Barton the chemist, in Bridge Street, originally founded in 1820, then taken over by Henry Barton in 1869, survived until 1987. Some of its medicine bottles are still on display at the Norris Museum. 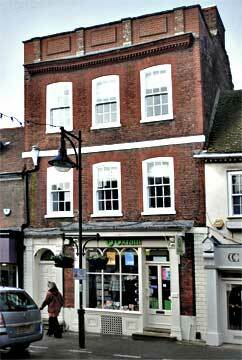 Right: the building, with its unchanged frontage but with the addition of a lamp post outside, is now used by Oxfam.